RSS global satellite temperatures show that the current decade (2011-2013) has cooled 0.086 degrees since the previous decade (2001-2010) This makes the current decade the fastest cooling decade in the satellite record. Fascinating data, but help me – a 3-year interval (2011, 2012, 2013, or 2011–2013) is a decade? 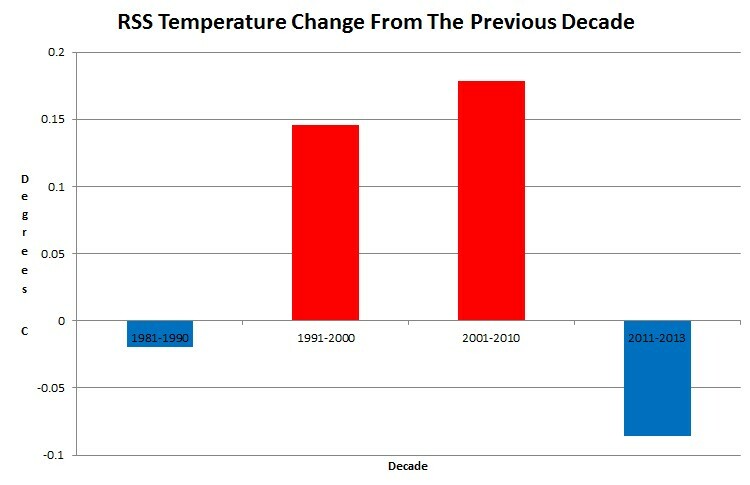 Hansen already knows the temperature for the rest of the decade, but RSS hasn’t published it yet. Only the world wide media is not trumpeting your nonsense to every corner of the Earth! Must be that darned Globull Warming…..
And yet they are still warmer than the 20th century average. Any prediction on how June 2013 will affect your 3-year old trend? ….And yet they are still warmer than the 20th century average. Any prediction on how June 2013 will affect your 3-year old trend? It is the RATE of Change that counts and the direction.